As hard as you plan ahead for problems when you’re on the road, a few will inevitably sneak in during your camping trip. Most times the fixes are simple ones and you can be back up and running in a few minutes. Those type of fixes require tools so you’ll find some of the most valuable ones to carry with you listed here. 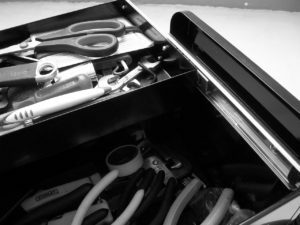 Hand tools – You’ll be glad you added these hand tools to your RV tool box. Pack a hammer, tape measure, variety of screwdrivers, socket set, a variety of knives and saws, wire cutters, pliers – both standard, needlenose, and channel-locks. Adhesives – You’ll certainly find a use for these and when you need them you really need them. Be sure to have on hand a sampling of silicone, pipe dope, super glue, vinyl repair, and something to seal canvas seams. You’ll also want to have duct tape and electrical tape on hand as well. Hardware – pack a variety of nuts, bolts, screws, washers, and zip ties. They will come in handy and save you a trip to the store when you just need a simple fix. Other things to consider are flashlights, plenty of batteries, water proof matches or lighters,and WD-40. You should have several types of gloves on hand. You’ll need latex (if you’re not allergic), garden style, and leather gloves, too. These should provide protection in almost any situation you find yourself. If you have these items on hand, packed conveniently in a medium sized tool box, you’ll be ready to handle pretty much any small inconvenience that comes your way. We hope your camping trip is a big success and that your path is paved with few fix-it incidents. We’re looking forward to seeing you this summer as you travel the state and enjoy the many RV parks and campgrounds available to you. Safe travels to you and your family.